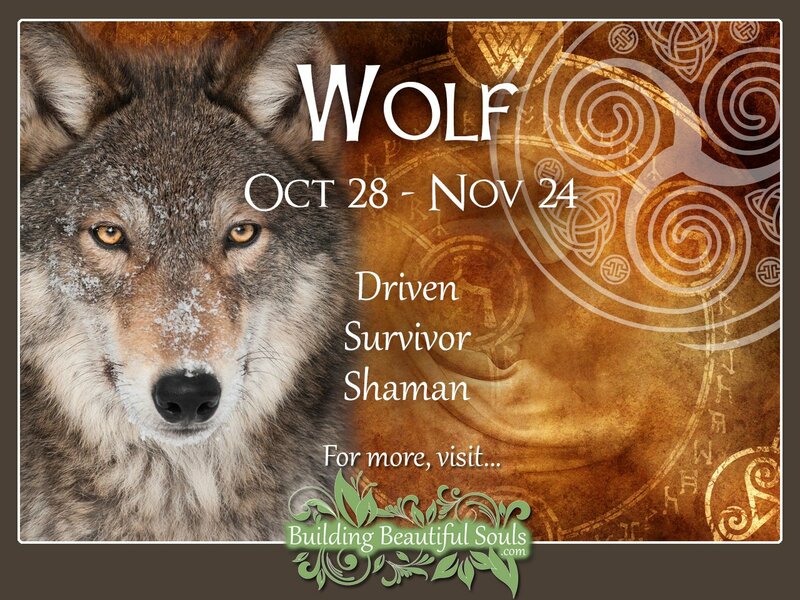 Those born under the Celtic Zodiac’s sign of the Wolf are fiercely determined and driven. These are not middle-of-the-road sorts. They blaze a trail and stick to it like glue. Wolf embodies a fixed, firm attitude, but it is one founded in a personal sense of honor and integrity. The conscious is Wolf’s ultimate guide. Wolf people are a rather curious lot. Instincts and perception provide them with a lot of information that others may not see. So while Wolf adjusts to a change based on foresight, those around him may scratch their head wondering what’s up. The Celtic Wolf enjoys unusual circumstances and interesting places. They often seek both out just because of innate inquisitiveness. One might call the Wolf an eclectic explorer. The more remote, peculiar or offbeat the destination the more fascinating Wolf finds it. Lay lines, spiritual power centers, alien landing sites, rare animals – these are all in Wolf’s repertoire for adventures. If you were born a Wolf, you may have an attraction to shamanic practices or other occult curiosities. There is something about Wolf that knows how to work between worlds be it light or dark, mundane or astral. Your thirst for knowledge drives you to places and experiences where other Animal Signs fear to tread. This is not a foolish endeavor. Wolf is wise and intuitive. You always have a feel for what’s ahead and prepare for difficulties, obstacles and even predators that might deter you from your goal. At the end of the day, Wolf is an excellent survivor even in risky endeavors. Wolf tends to plan and put together tactics that should prove out. If they don’t you always have a back-up plan, even if that plan is a calculated retreat. Wolf knows there is no dishonor when it becomes apparent that the situation is either unhealthy or a no-win scenario. Wolf is a brooder. Ever thinking, ever processing, it becomes easy to get caught up in your thoughts and let the rest of the world fade away. This is something of which Wolf must remain aware. Your intelligence may not be able to keep logic reigned in vs. your more primal ideas and longings. There are times and spaces for your passions and its certainly OK to fantasize, but if you give in wholly to that world you will lose a lot of the attributes on which you rely heavily to navigate daily life. The life of a Wolf is often on the wild side. Sometimes alone, sometimes in a pack, Wolf may struggle with extremes. As a result, Wolf has compassion for others in need. This often leads to charitable efforts to help and protect the “little guy” from an often harsh world. Wolf succeeds in this role very well because they have walked the path of struggle and lived to tell the tale. Wolf enjoys having some old-fashioned fun from time to time. This “fun” gets meticulously scheduled in between other pressing matters and brain-storming. This is what makes you a highly complex creature. You feel things deeply, and those emotions often motivate you for boon or bane. When you find negativity filling your soul, turn to meditation and narrowing your thoughts toward something more positive… like, oh yeah, FUN. Wolf people are protectors and guardians particularly for things they consider sacrosanct. Wolf will howl in warning of an impending threat. Wolf also stands his ground when danger threatens. What wolf loves will always be safe to the best of his ability. The Element of Water definitely plays a role in Wolf’s emotional life. You love your freedom and riding the wave. This sometimes undermines what some might consider “normal” life structures. Be careful the tide doesn’t carry you away. Find a way to have an anchor (you can always haul it in when you want to let loose again). Wolf’s ruling planet is Pluto. Like the planet itself, you sometimes remain on the edges of life away from the chaos. Wolf’s private time offers healing and renewal. It is here that you re-attune yourself to the cycles of life and indeed the Universe itself. There is a lot of true wonder in Wolf’s life.